Modern lighting boards, computers, and other equipment are very sensitive devices. Interference or fluctuations in the power supplied to these devices can cause crashes of computers and lighting boards, and in some cases permanent damage. Thus, it is desirable to use some sort of protection on the power line when plugging in these devices. Most people are familiar with the concept of a surge suppresor for computers and other equipment. Regular, inexpensive surge suppressing power strips can be used to provide a degree of protection for connected equipment. However, more expensive devices that provide more protection and filtering of the power line are available. These devices often come in rack-mount cases and provide several outlets for the connection of equipment. Some models even include a line voltage and current indicators that can be useful when connecting to an unfamiliar power source. These indicators can show faults on the power line before the first equipment is even turned on. One such power protection device is shown in figure 7.6. Figure 7.6: A power protection device manufactured by Furman, Inc. Devices such as this provide several outlets filtered from EMI and RFI interference. Often times, even expensive power line conditioners are not enough protection. This is especially true in cases where computers and computerized lighting boards are used. Having the power go out when working on computer-based equipment can be frustrating, and can often result in lost data, not to mention time. Because of this, battery backup units called Uninterruptable Power Supplies (UPSs) have been developed. UPSs continue to provide A.C. power for a period of time in the event of a power failure, through the use of a battery and an inverter. UPSs with different capacities are available, with the largest affording extremely long run times for equipment. 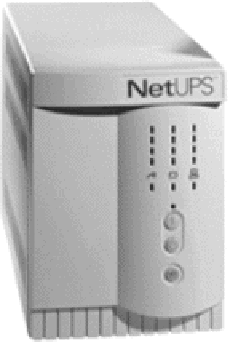 Whenever possible, UPSs should be used to run computer-based equipment, to prevent the inevitable situation of losing data because a power cord was tripped over and unplugged! Figure 7.7: An uninterruptable power supply, manufactured by Exide/Yuasa Corporation. UPSs provide protection to devices connected to them by keeping them powered in the event of a loss of power.